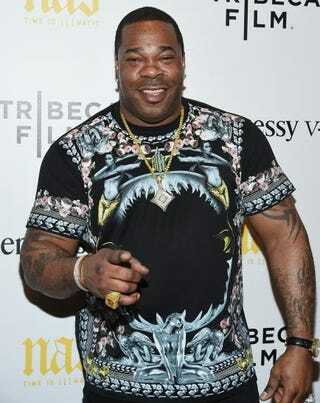 Apparently, the gym can be a dangerous place filled with flying bottles of Muscle Milk, especially if you get on Busta Rhymes' bad side. Rhymes was charged with assault Monday after an arrest stemming from an altercation at his gym. Rhymes was accused of throwing a cardboard container of the protein shake at the back of the head of an employee of Steel Gym in New York City. According to the New York Daily News, the gym employee and the rapper earlier had had a few words with each other before the altercation occurred, when the gym employee wouldn't let a cameraman into the gym to record Rhymes' workout routine. The police say Rhymes hurled a 17-ounce cardboard container of strawberry Lean Body protein drink. "Things got heated. Busta splashed water on him and the employee threw water back," one eyewitness, Sean Aird, told the Daily News. "Busta's security got between them. The cops came and [the employee] kept changing his story." Other people at the gym stated that Rhymes and the employee have had a beef for a while. As for Rhymes, he just thinks the arrest was dumb. "It's stupid," Rhymes told the Daily News after he was released Monday. His lawyer added, "It's ridiculous; it was literally a bottle of Muscle Milk." Rhymes posted a photo on Instagram as he was leaving the courtroom, thanking his fans for support. "Thanks to everyone who helped expedite this evening for me. I'm good and we're back to the grind. Heading 2 the studio 2 turn the [bulls—t] into GREATNESS. I'm super good."